This has honestly been the hardest opening paragraph to compose since I started writing for Jump Dash Roll. There have been no fewer than six iterations of this introduction. I had this grand speech all typed up about how PC gaming took a fraction of the coordinated skill of console gaming, how modern gaming focused too much on FPS and not the vast world building strategies of yesteryear. I even considered waxing lyrical about how it felt increasingly like the gaming world was being dumbed down and whether it would it ever be the same when we have greedy corporations running the show and choking release-day content. Oh, also I wrote a little bit about PC vs console, because y’know, this review is about a console port. So I wasn’t going completely off course with my thoughts. Clearly, I had a lot things to get off my chest. Ultimately, I realised, who cares? 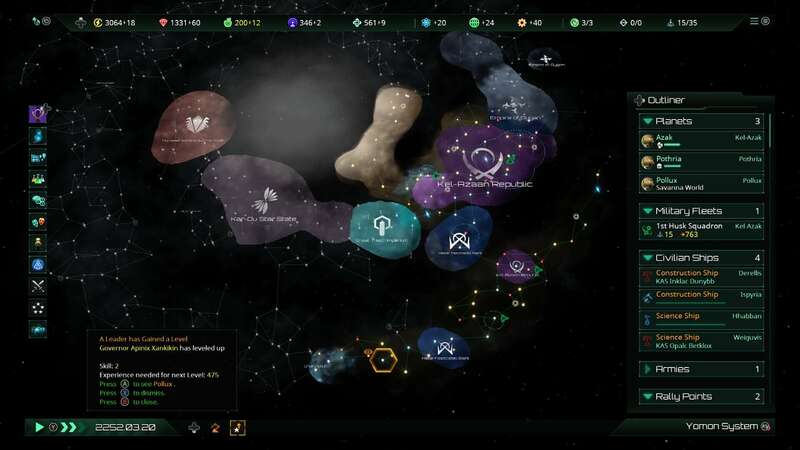 Games are games, and being able to play them on any medium is a rare joy — especially when Paradox has come along and done a beautiful job bringing the grand strategy game, Stellaris, from PC to both the Xbox One and PS4. ‍How you decide to act when making first contact will have ramifications later on. 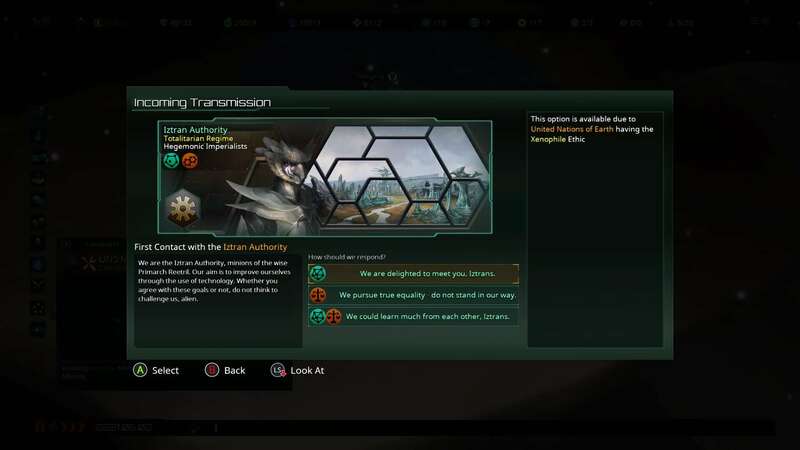 In Stellaris, you take control of a single newly space-faring species. From the Commonwealth of Man, to the Jehetma Dominion and the Tzynn Empire and more — there are nine to choose from, with each one capable of diversifying both in terms of genetics and ethics throughout the course of your individual playthrough. There is a mind-boggling amount of possibility in guiding your chosen species through the galaxy. There are no missions per se, rather a continuous evolution of demands and objectives that occur organically as you explore neighbouring systems and colonise accordingly. This will depend entirely on whether or not you expand aggressively, attempt to create a federation or perhaps behave in an isolationist manner. Stellaris is an utter goldmine of possibility. This can make Stellaris rather intimidating when you begin to play it. A medium-sized map will yield a massive 400 systems to explore (a large map will increase it to 600), filled with as many (or as few) other empires as you so wish. Default settings will populate the galaxy with eight other species to encounter — though that is not including potential space-dwelling monsters, fallen empires, pirates and pre-hyperspace civilisations that you may encounter. 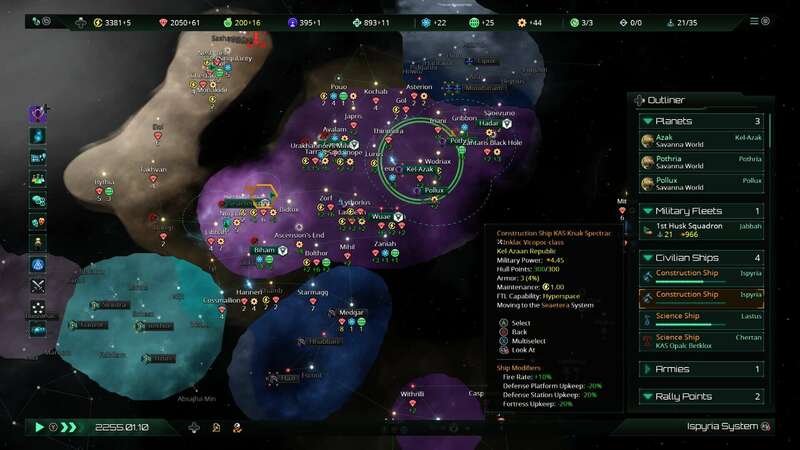 While you do have a friendly AI assistant guiding you in your first hours of building your empire, Stellaris is wonderfully unashamed in its assertion that this is a serious game for serious star-empire builders. This does give the game a bit of a ‘Marmite’ aesthetic (love it or hate it! ), though personally, I find that to be part of its charm. Push through that steep learning curve, and you’re rewarded with a game with near limitless possibilities and pathways, on which you are never truly stuck. For example, you could begin a game as part of a fanatical, militant dictatorship. These policies may work for a spell but your population, once discovering that there are ways of coexisting with other species, may demand a more xenophilic government. It’s your job to keep the people happy and minimise civil unrest, so you have to adapt accordingly. Whether subduing the revolting faction and tightening your grip on your systems, or appeasing them by offering trade negotiations to species you were once hostile to(not that they’ll be in any rush to trust you!) — the choices, and consequences, are wholly in your hands. Away from the population, you are also able to design and customise every single starship that comes out of your shipyards. Again, there is an utter myriad of possibilities (thankfully, Stellaris as a default will always ‘auto-design’ the best all round options for each class), meaning you can be as specialist, general or completely ‘out-there’ as you wish. ‍While it does look complex, there is a certain intuitiveness to the game’s layout. The variety of systems in the galaxy makes for some spectacular lighting effects. 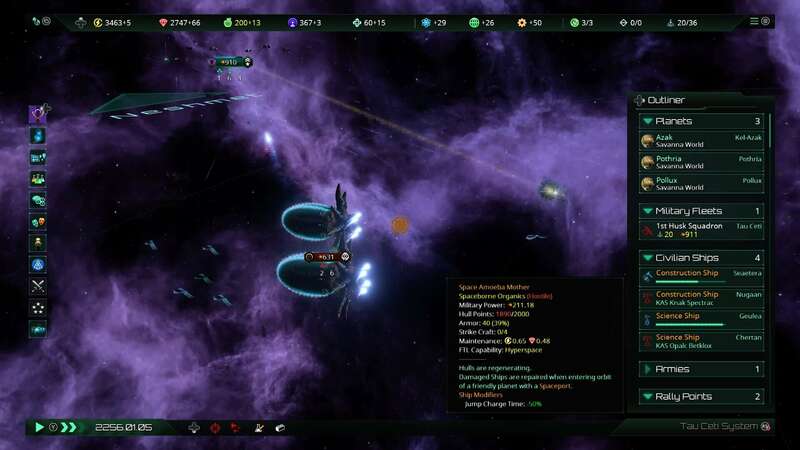 Black holes have a real menace about them, and dropping your fleet into a pulsar system has a real sense of drama in a game that relies rather heavily on decisions taken very much away from the action on the ground. It’s a welcome level of effort for a game that mostly relies on text screens to do the heavy lifting — especially when your war fleets engage with hostile species. But onto the technicalities of porting a PC game to console. Probably the biggest sticking point with nearly any strategy game on a console is the user interface. A mouse gives a greater level of control over armies and the inevitable plethora of menus that adorn a grand strategy game — console controllers simply don’t have that versatility. Made-for-console strategy games such as Halo Wars had the benefit of creating a snappy interface from scratch, but PC to console ports have an unenviable task of converting a designed-for-mouse style into the console world. Thankfully, Paradox has done a superb job by simply utilising the D-pad to quickly snap to the various interfaces. A click in a particular direction will snap all controls to the relevant menu without any chance of accidentally doing something unintended on the system map. The only niggle I can comment on is that I would often forget to disengage the menu with a ‘B’ button press meaning that, quite often, I would send a ship to do something when, in fact, I just wanted to select something on the sector map. It’s something that I still find myself doing — even tens of hours into playing the game. It’s a minor thing, but that can cause annoyance as there doesn’t seem to be a way to effectively remap the controller layout to solve the problem. Another inevitable loss on a console port is freedom of screen movement. All cursor movement is centred on the screen on console, with zoom operated by the left and right triggers. On a PC, this movement would be operated via keyboard while your mouse cursor would move freely around the screen. This does mean that selecting things in system can be more than a little tricky — especially if your space is looking a little crowded. In smaller battles, or sparser systems, this is a complete non-issue, but when things start getting heated it can be incredibly frustrating to click on individual fleets or platforms, often resulting in selecting the wrong ship or planet. ‍The scope and size of the galaxy map is just staggering. As such, you do tend to find yourself sitting on the galaxy map commanding and directing your ships and systems from afar via the wider interfaces. Personally, I held no issue with this as it felt like an inevitable progression as your empire grew — but I can fully appreciate that some players may find this dissociation a little draining. That being said, if you’re a fan of grand strategy then this is really is the game for you. I never grew bored of watching fleet movements, exploration and construction ships surveying and building across distant galactic arms, as you simultaneously manage terraforming operations and balancing trade deals with neighbouring species while considering options against hostile threats. I’ve found hours of time slipping past as I delve further and further into creating my fledgling star-empires. It really is utterly intoxicating.